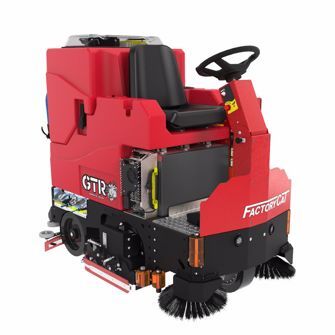 The Factory Cat GTR battery ride on floor scrubber is one of the most powerful scrubbers in its class. It’s known for its value to the customer and its American-made high quality that is designed to perform and built to withstand. The GTR is the big brother to the GTX scrubber model. Service Cabinet- includes six different features that keep you in touch with your machine and its maintenance needs. Recovery and Vac Box- the Drain Saver Basket collects debris, so it doesn’t clog your floor drains, and red-light indicators notify you when tank is nearly full or squeegees are clogged. ST model/HD model- depending on much horsepower you desire. Disk brush/Cylindrical brush- depending on if you want to simultaneously sweep and scrub. Optional onboard charger- for convenience. Side doors- to protect scrub deck from impact damage. Spray jet- to spray hard to reach areas. Overhead guard- to protect operator. Side brooms- to sweep up against walls and beneath racking. Disk Cleaning Path- 30", or 34"
Cylindrical Cleaning Path- 29", 33"